This is a modest, slim chapbook but beautifully produced with a stitched Sundance Ultra Felt paper cover printed in a limited edition of 100 copies. It comes with a delightfully evocative woodlands road cover photograph taken by the poet herself. with a drift of fibrous dust. reminding us that we were novices. with the piles of brittle flowered linoleum. in the shape of elm leaves. still shiny after a century in the dark. like the edge of a pinking shear. onto the rubble, wood and brick hissing with steam. clean and straight, solid as a henge. like the heavy press of a palm. 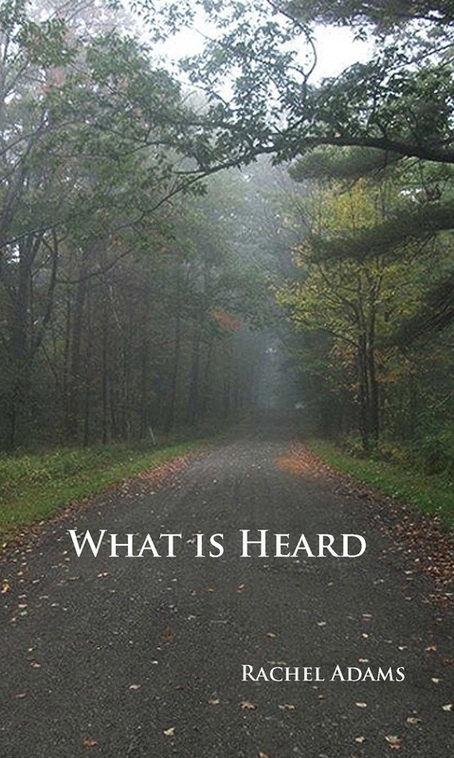 What Is Heard has been published in a limited edition of 100 numbered copies. Get one while you still can! Rachel Adams lives in Washington, D.C., where she serves as the editor at an advocacy nonprofit and of the quarterly literary journal Lines + Stars. Her poetry has appeared in such publications as Memoir, Arsenic Lobster, Town Creek Poetry, Four and Twenty, Crack the Spine, The Urbanite, Melusine, The Conium Review, The Wayfarer, Free State Review, and elsewhere; her piece “What You Bring Along” was nominated for a Pushcart Prize in 2013. She received her BA in English from the Catholic University of America and her MA in writing from the Johns Hopkins University. Christopher T. George is one of the editors of Loch Raven Review. He was born in Liverpool, England in 1948 and first emigrated to the United States with his parents in 1955. He lives in Baltimore, Maryland, near Johns Hopkins University with his wife Donna and two cats. His poetry has been published in Poet Lore, Lite, Maryland Poetry Review, Smoke, and Bogg, and online at Crescent Moon Journal, Electric Acorn, Melic Review, Painted Moon Review, Pierian Springs, the poetry (WORM), Triplopia, and Web Del Sol Review. He is the editor of the Desert Moon Review poetry workshop at http://www.thedesertmoonreview.com and has his own personal poetry site at http://chrisgeorge.netpublish.net.